Almost three years ago, Disney announced the purchase of Lucasfilm and the development of Star Wars: Episode 7. Cut to now when we’re only four months away from the film’s theatrical release. Given all the hype and anticipation surrounding this, it’s time to start thinking about the format in which you want to experience The Force Awakens. According to many there’s only one answer: IMAX. And here’s why. According to Vahn from MakingStarWars.net, he received an invite from his local theater to install Star Wars: The Force Awakens into their IMAX projector a week before the release. As such, he was given the complete specs for this release. 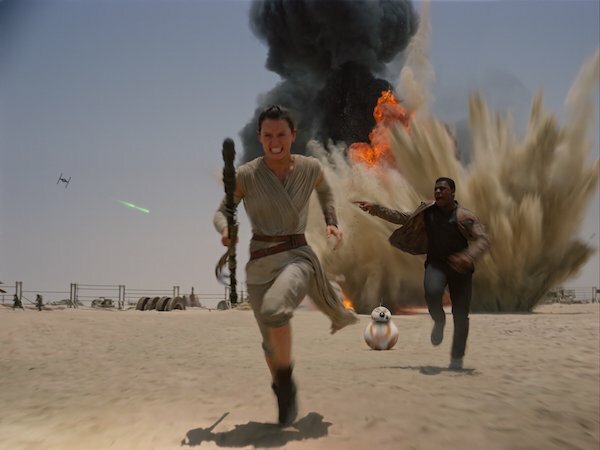 Though J.J. Abrams revealed that he used an IMAX camera on the film, he later stated that it’s only one sequence, “but it’s a good sequence.” MSW states that it’s most likely the escape from the desert planet Jakku, and this scene will show in 70MM. The “true” eight-story IMAX theaters, as he calls them, will present the full 70MM sequence, while the “shrunk” IMAX theaters will play the Digital IMAX converted format. While it’s not the worst thing in the world to go down to the Digital IMAX converted format, it won’t give you the full experience of this scene. So for all you diehard cinephiles and Star Wars fans, you might want to consider making your first experience of The Force Awakens even more memorable. The seventh installment in the Star Wars franchise hits theaters on December 18, featuring a cast of returning players — like Mark Hamill, Carrie Fisher, and Harrison Ford — and franchise newbies — like Boyega, Ridley, Oscar Isaac, Adam Driver, Dohmnall Gleeson, Gwendoline Christie, Lupita Nyong’o, Andy Serkis, and Max von Sydow.